It is no doubt that there are lots of applications to see what engine lights mean on your car’s dashboard, but as far as I know there has never been one released into Cydia. That is why when iEngineCheck made its way into Cydia recently I knew it would catch the attention of numerous people. Simply download the application and you will see a new iEngineCheck icon on your SpringBoard (homescreen). Upon launching the application you will need to select your cars manufacture and then the model. Once you do this you will be taken to an overview with the various dashboard-lights, if you click on one of these lights you will be taken to a page with more information on that specific light. My only gripe with the iEngineCheck Cydia app is that there are not many supported manufactures. If you find this to be the case as well, and can’t find your car’s manufacture, you can submit a request to the developer for it to be added. Please also keep in mind that although this application is fairly accurate, make sure you always get a professionals opinion if you feel there is something seriously wrong with your car. 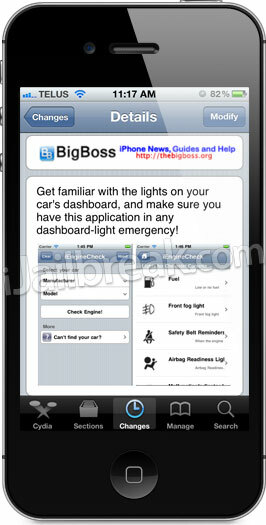 If you are interested in the iEngineCheck Cydia app you can find it through the BigBoss repo for FREE. Did you try this Cydia app? Please share your initial thoughts about it in the comments section below.